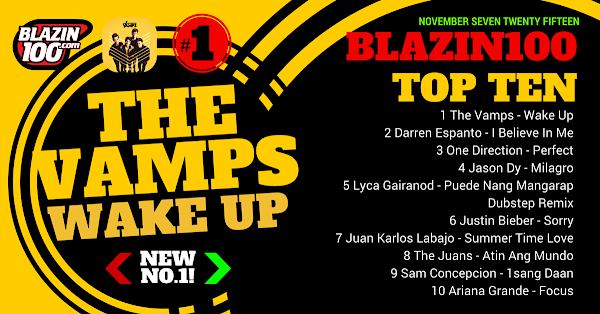 The first chart results for November of 2015 and The Vamps is at the top with Wake Up. Darren Espanto - I Believe In Me is at number 2. One Direction is number 3 with Perfect. And former number 1 Jason Dy is number 4. Closing the top 5, we have Lyca Gairanod. Justin Bieber's Sorry is at number 6 from 7 last week. While Juan Karlos Labajo is at 7 from 8 previously. The Juans are at number 8. Sam Concepcion at number 9 and Ariana Grande debuting at number 10.